Perfect Engineer offer complerte conveying solutions under one roof. we are a leading supplier of Belt conveyors, Roller conveyors, Overhead conveyors, Modular Conveyors and other conveyor systems from India. We manufacture conveying solutions for Auto industry, Electronics, Packaging industry, pharmaceuticals, FMCG, Soaps & detergents, Consumer Durables and the list is endless. With our policy of TQPS (timely delivery of quality products & services), we have won the trust of various MNCs, Private Companies, PSU's and big industrial houses of India. We provide complete conveying System to our clients. we are leading supplier of conveyer systems, Belt conveyors, Roller Conveyor, Over Head Conveyors, Modular Conveyors Etc. Belt Conveyors can be used for different applications of conveying Raw materials to finished goods; and at Dynamic Industrials these are specifically designed according to your specific needs. Belt conveyors are widely applicable in bulk material conveying over long distances. These are available in custom made designs can be developed up to 45 °troughs and 18 °elevations Offered with / without hoods, walkways etc. as per the project demand, most of the bulk conveying requirements are fulfilled. Flat Belt conveyors are generally used where the belts are supported with a metallic bed with a fewer rollers in between. 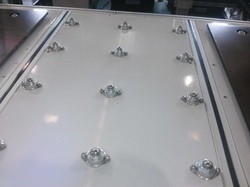 In these horizontal conveyors, the point of loading and point of discharge generally have the same height. Special Provision of height adjustments are done on customers' demand. 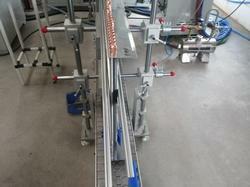 As the name suggests, these conveyors are used for packing or sorting of manufactured goods. 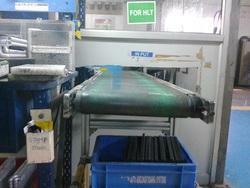 These conveyors are equipped with working table on both sides of conveyors, enabling the packing / sorting process. Generally the individual packed goods are put into the designated cartons which are conveyed aside or on the same conveyor for collection at the discharge end. These kinds of conveyors have high application in pharma, food packing, automobile ancillaries, electronic & electric components etc. We provide complete conveying system to our clients. We are leading supplier of Conveyor System, Belt conveyors, Roller Conveyors, Overhead Conveyor. Modular Conveyors etc. Belt Conveyors are generally the simplest and most economical means of conveying Unit Goods, like boxes, cans, cartons, crates, In-Process inventories, packed goods in horizontal and inclined planes, either unidirectionally or in reversible directions over appreciable lengths. Standard Components of Drive, Tension and Snub Pulleys, Carrying and Return Idlers, Skid Plates, Stringers, Tie Rods, Adjustable Support Legs and Smiley Brackets of Modular Designs are available from 50mm up to 1000mm widths. All external Surfaces are finished with Powder Coated Paints or Bright Zinc Plating, as desired by the customer. PU Coated, PVC Impregnated and Nylon Reinforced Belts, specially designed for long service life of the conveyors are used. A wide range of Mechanical Specifications are available covering High Temperature, Abrasion Resistance, Food Grade, Accumulation Type, Oil Resistant, Chemical Resistant and more. We are leading manufacturer of Slat Conveyor Belts to our valuable client. We are manufacturing Slat & Belt conveyor for different application. 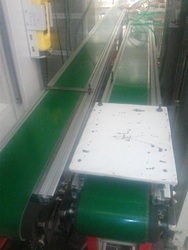 The Conveyors driven by geared motors for different Speed.